I hope you are all well and haven't been blown away in this wild weather! 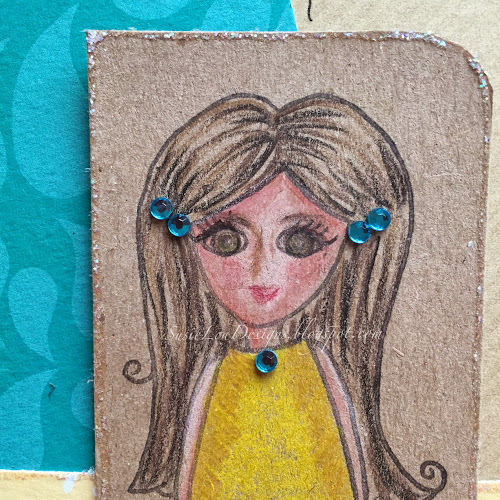 Today, it is my (Susie) turn to show you a little something and I decided that I fancied stamping one of the lovely Doodle Dolls. 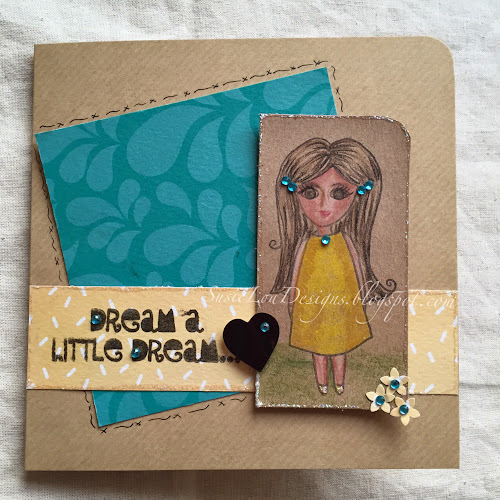 This one is called Dream a Little Dream and is lovely and easy to colour. I stamped her onto Kraft card (aka the inside of my Christmas wrapping paper!) and coloured her with my Polychromo pencils. After shading and colouring her face, I stamped her beautiful big eyes and added a little more shading for her nose and her eyebrows. After that, I decided I would give her a little smile.....must have been feeling brave, huh?! As is pretty normal for me, I kept the layout really simple to show off the gorgeous teal/turquoise paper and image. (Have I ever told you that my favourite colour is teal/turquoise?!!). The papers, heart and turquoise gems are from various A Few of My Favourite Things kits. I decided to add a little doodling and Stardust Stickles to finish off my card.